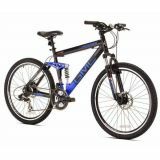 26" Mountain Bicycle Features Alloy Crank, 36 Spoke Alloy Rims, Disc Brakes Front & Rear, Quick Release Front Wheel, Quick Release Seat Post Clamp, Aluminum Dual Suspension Frame, and 21 Speed Shimano EZ Fire Shifting. 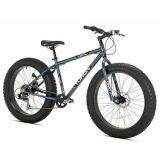 26" Fat Tire Bicycle Features Alloy Stem, Alloy Pedals, Alloy Crank Arms, Aluminum Frame, Massive 26" x 4" Tires, Front and Rear Disc Brakes, Quick Release Seat Post Clamp, and Seven Speed Shimano Drivetrain with Paddle Shifters. 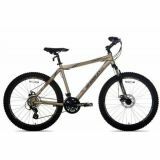 26" Mountain Bicycle Features Alloy Platform Pedals, Alloy Threadless Stem, Alloy Crown Suspension Fork, Suntour Alloy 42/32/22/Crank, Shimano Altus Rear Derailleur, 36 Spoke Alloy Double Wall Rims, Front & Rear Mechanical Disc Brakes, and Custom Hydroformed Aluminum Frame. 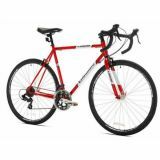 Road Bicycle Features Kenda 700x25c Tires, Prowheel Aluminum Cranks 170mm, 14-Speed Shimano Tourney STI Drive Train, Vitesse Alloy Rims 700c 32 Hole High V-Profile, Hand Crafted High Tensile Steel Frame and Fork, and 1-1/8" Alloy Threadless Stem and Alloy Handlebar.